LG and Dolby have given the first public demonstration of multichannel surround sound from a phone at Mobile World Congress, where an Android-based LG smartphone was shown delivering 5.1 channels of aural excellence. 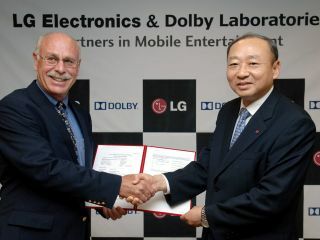 The two companies have been collaborating on mobile sound since LG first agreed to use Dolby Mobile technologies in 2008. The pairing has since produced 20 phone models using some degree of enhanced sound from the audio giant. "We are pleased to be working with LG to showcase the latest Dolby innovations for mobile on an LG Android-based smartphone," Dolby's Ramzi Haidamus told the press. "Dolby Mobile expands the possibilities of mobile entertainment, allowing people to enjoy richer, more cinema-like audio experiences on the go." LG's Dr Skott Ahn agreed: "Together with Dolby, we hope to raise the bar for audio quality in mobile devices and the mobile industry as a whole." Dolby and LG showed off a form of mobile surround sound at last year's Mobile World Congress, and have obviously continued to develop their technologies. "As a leader in the mobile industry, LG is devoted to delivering the best new features to our customers for a better user experience. Today's announcement represents the latest milestone in joint efforts to improve the performance of our handsets, including feature phones and smartphones," said Ahn.